Lions. Kings of the jungle and the pride of Africa. They live on the African savannah, caring for their young and protecting their pride. However, some lions are deprived a life in the wild. 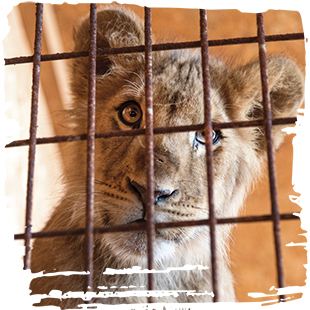 Born into captivity, they never live as lions are meant to – wild and free. Unfortunately, four little lion cubs suffered this reality. Horus, Kuuma, Dadou and a still to be named girl, desperately need your help. All only a few months old, they were taken from their mothers before they were weaned and found in terrible suffering – battling the pain of glaucoma, extreme hair loss, skin irritations and diarrhoea. Shockingly, they were found in captive conditions no animal should ever be subjected to – an apartment, a garage, even a Lamborghini on the Champs-Elysées. This is because they are part of Europe's trade in wild animals: from circuses, zoos and private keeping – sold to be pets. 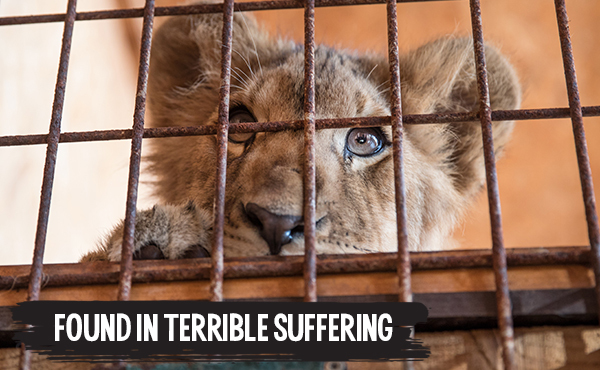 An increasing number of wild animals, just like these Lions of Lyon, are kept in shockingly deprived conditions. They can come from many different sources. Some animals may be bred in captivity, some may be traded as surplus from zoos and circuses, while others are caught from the wild. 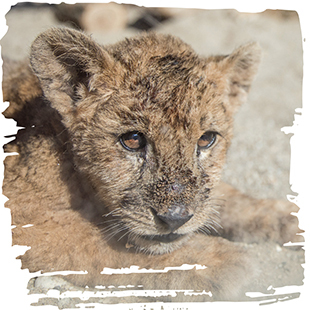 We don’t know where these four little cubs originally came from, but we do know that, with your help, we can give them a better future. 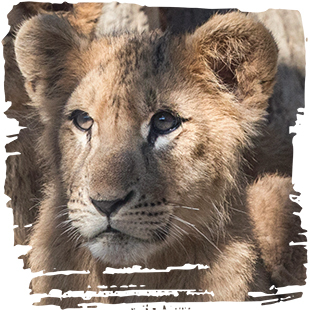 The cubs are currently in a temporary home in Lyon, France, and you can find out more about them on the following page. 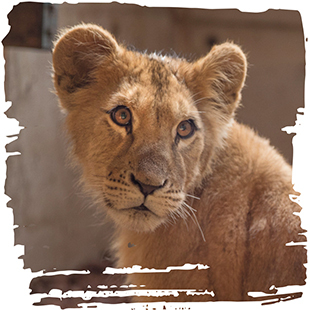 We would dearly love to give them a permanent home at our big cat rescue centre in Shamwari Private Game Reserve, South Africa, where they will receive lifetime care in a safe, spacious and enriching environment, surrounded by the sights and sounds of Africa. This is the biggest lion relocation in our 35-year history, but these four cubs are probably the smallest we have helped. We are always so grateful for the support we receive, and we do hope that you will be able to give this urban pride a life worth living. 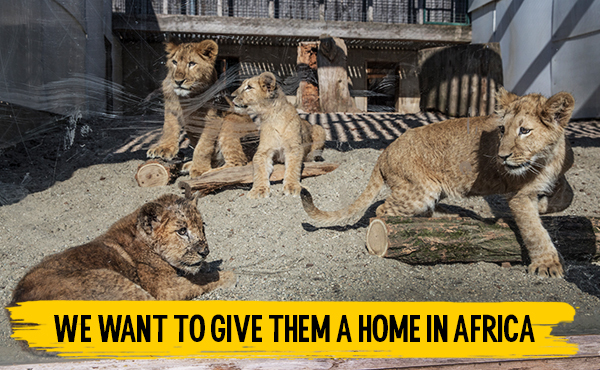 CLICK HERE TO MAKE A DONATION OR TEXT LIONS TO 70577 TO GIVE £10. Horus is the largest of the four cubs and is about seven months old. He was found in reasonably good health on a child’s bed in an apartment on the outskirts of Paris. His owner, who was hiding in a neighbour’s cupboard when Horus was found, had posted images of the cub on Snapchat. He was sentenced to six months in prison for illegally keeping a wild animal. Kuuma was found on the same day as Horus in a garage in Marseille. She was very unwell and underweight, with a skin irritation, dull coat, gastrointestinal problems and corneal ulcers. Now thought to be about seven months old, Kuuma has since recovered, but her eyes are being monitored. Her owner has been prosecuted and the case is waiting to go to court. Dadou was found on Paris’ most famous street – the Champs-Elysées – in the back of a Lamborghini. His owner was caught by police officers taking photos with the cub. Dadou, who is missing the tip of his tail, is also thought to be about seven months old. When he was found, he had weak hind legs, but has now recovered. Dadou’s case is waiting to go to court. ‘Girl’ is the smallest and youngest of the cubs, at about five months old. She was surrendered by her owner and was very unwell. She had glaucoma, and was under-developed and underweight, with extreme hair loss and diarrhoea. ‘Girl’ is now doing much better. Her hair has grown back and she is slowly gaining weight. Her court case is ongoing.